Hi everyone, it has been a while since I’ve sat down to “pen” a quick note. I wanted to reflect over the past year and thank everyone who’s stopped in, made a comment or was inspired to try one of our recipes. I simply want to wish all of you a healthy, safe and fantastic 2015. May it bring new recipes, less bloating and lots of laughter mixed in with a little adventure. 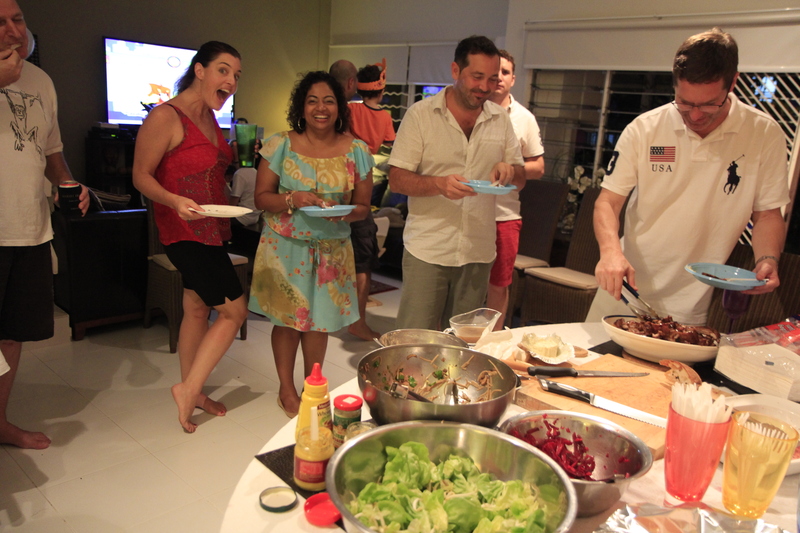 So, here are a few photos from our annual New Years Eve party. We hosted over 40 people with the legendary and traditional pulled pork (a 16.3 pound/7.4 kg beast that took 33.4 hours!) A special thanks to Heather, the kids and Yaya for the inspiration and the clean up! Cheers! Let me start this post by wishing my lovely bride Heather the happiest of birthdays! May you always have health, happiness, laughter and BBQ in your life! Love you madly darling! 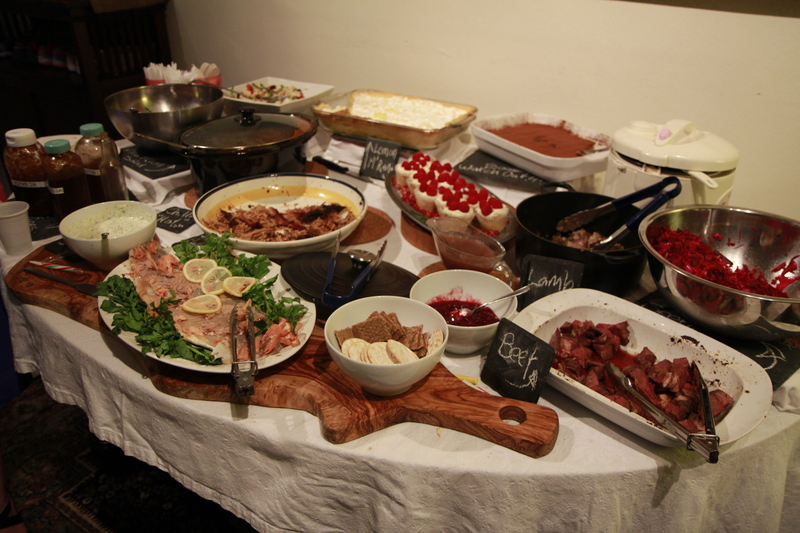 OK, so one joint of meat fed about 30+ guests but that single joint of meat also yielded 4 or 5 separate surprises too. 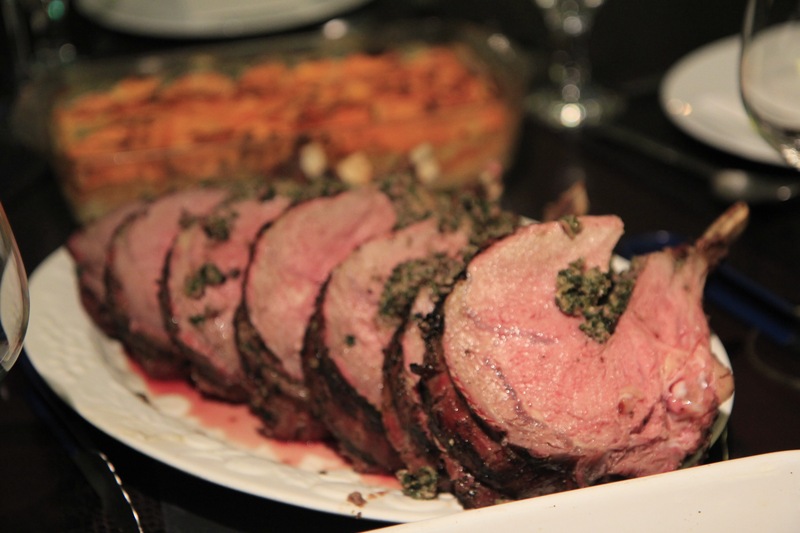 The challenge was to ensure that every piece of this standing rib roast when to good use. I purchased this roast from our friends at QB in Jurong during our usual 6 week stock up shop. $150 is not a cheap piece of beef but if you treat it respectfully, you can yield an incredible amount from one standing rib roast. So the first thing was to remove the rib bones. I watched a great video (click here) by Chef Paul Malcolm who shows his students the things to do to an OP roast. 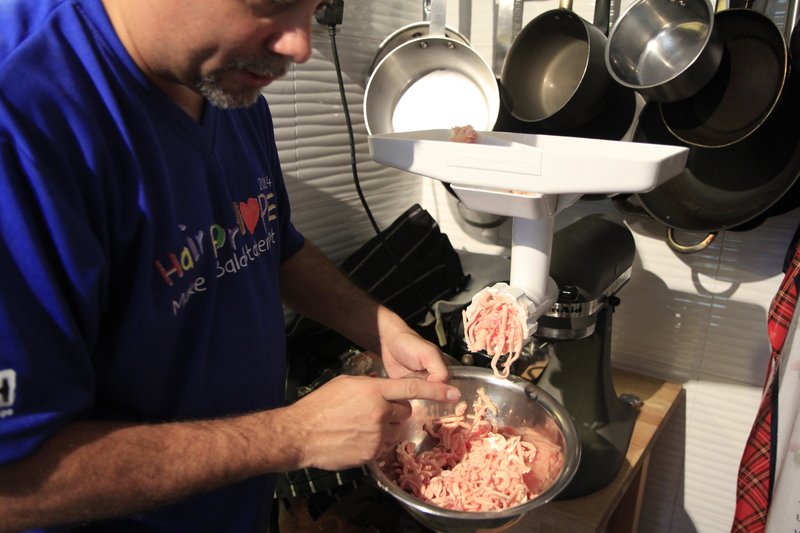 Sharpen your knives and have some fun learning how to trim your beef into a work of art! After removing the rib bones, I then removed the fat cap as well as any large pieces connective tissue, any big chunks of fat and the silver skin. Save all of this in a metal bowl for later use! Now take your roast and ensure you pat it into an even cylinder shape. Get some butcher’s twine and truss the roast with a piece of twine every 1.5 inches. This ensures a uniform cook and it looks impressive as well! Now you’ll dry brine the roast for the next 24 hours. Dry brine? Simple! Liberally salt your roast with Kosher salt. Don’t be shy here. Once you’ve covered all of the roast, wrap it tightly in cling film, put it in a dish and leave it overnight. 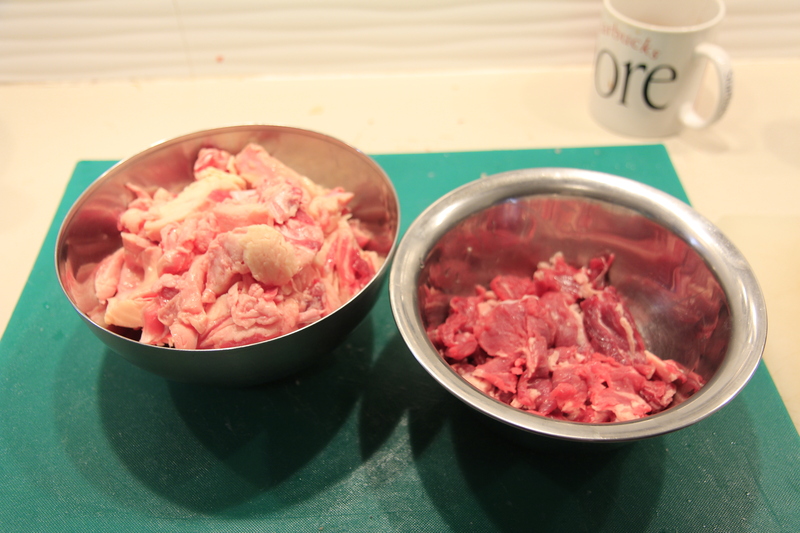 Any meat that you manage to trim, save it! Put it in a bowl and cover it with cling film. 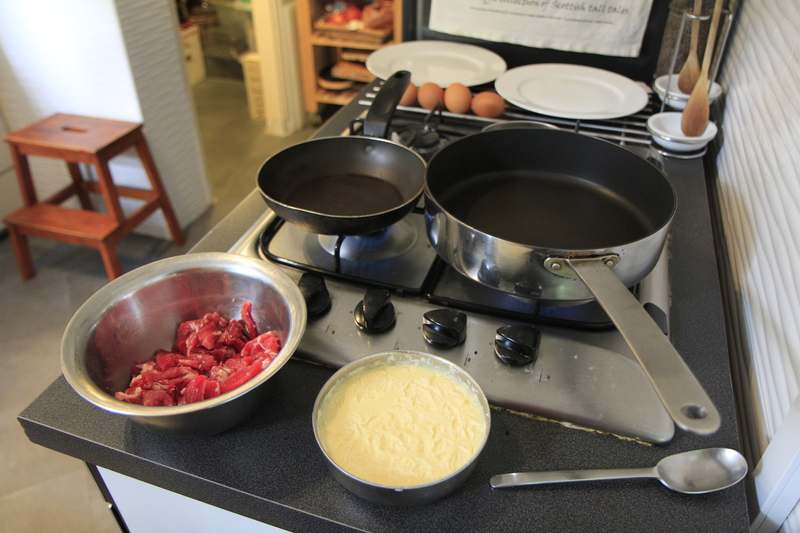 I made a wonderful steak and eggs for breakfast this morning to help with the hangover! I then took the ribs, sliced them and prepared to smoke them on the mini big green egg! 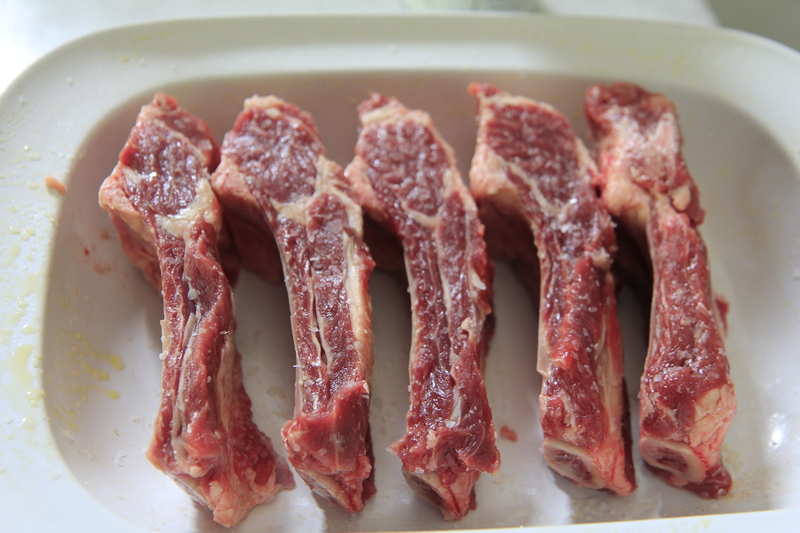 I used Meathead Goldwyn’s method for the ribs – click here – My recommendation would be to half the amount of black pepper – these ribs were delicious but definitely a bit too peppery for my taste. Note for future! We saved the bones for making a beef stock afterwards. 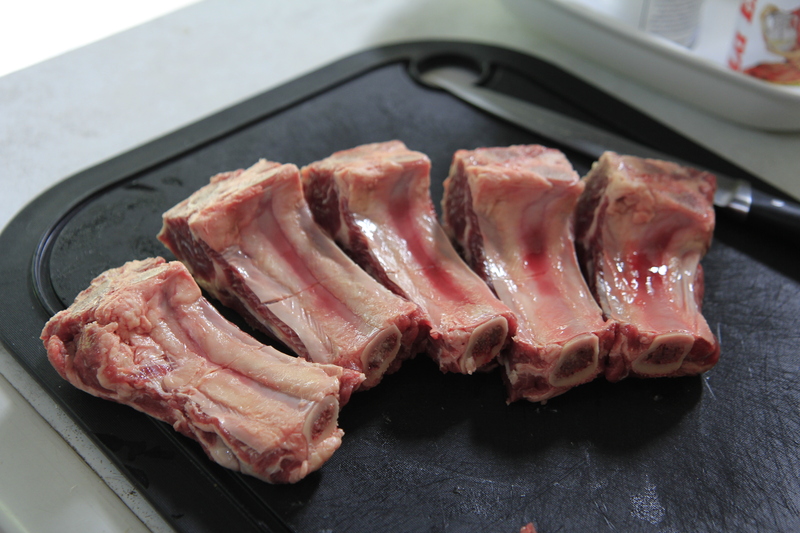 Simple cover the bones with some boiling water (with a beef stock cube or two mixed in.) I added a few cloves of crushed garlic, 4 dried mushrooms, a bay leaf and some dried oregano, thyme and sage. Let that boil then simmer for 2 hours. Set it aside and you’ve got a beautiful thin beef sauce for your roast. Now fast forward to the morning of the roasting. You’ll start your morning by preparing your herb paste that will ensure an amazing flavour and a crust like no other. Mix together the dry ingredients and then add the oil. Take a small whisk and stir it all together. 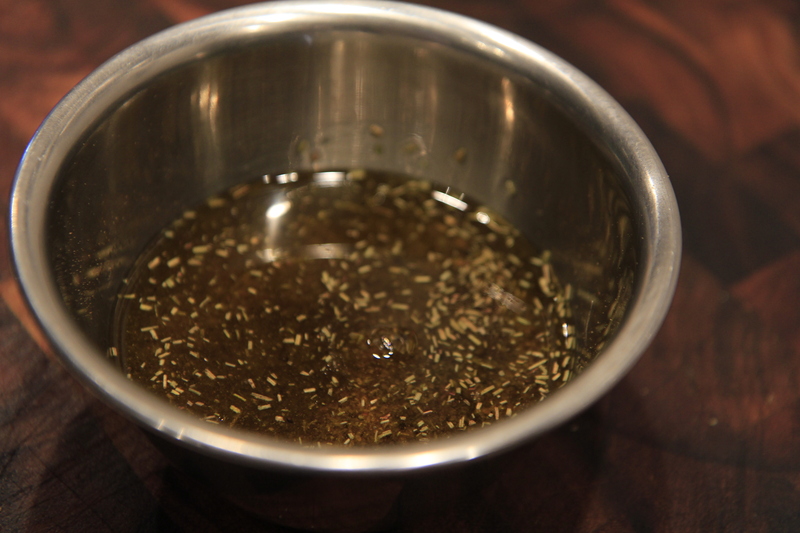 Let the paste sit for at least an hour so that the oil absorbs all the herb flavours. Once that hour goes by, take the roast out of the fridge, unwrap the cling film and place the roast back in a dish that can catch any of the paste that you’ll put on. Make sure you massage the paste into the meat thoroughly. When ready, wrap the roast again in some clean cling film and put it back into the fridge for as long as you can – you’ll go from fridge to grill so the longer the paste can penetrate the meat, the better! Now, set up your grill for indirect heat and stabilise your temperature at 225F (107C) – add a small bit of wood for smoke. I used whisky soaked oak for this roast. Don’t overdo it here, just a kiss of smoke will do the trick! 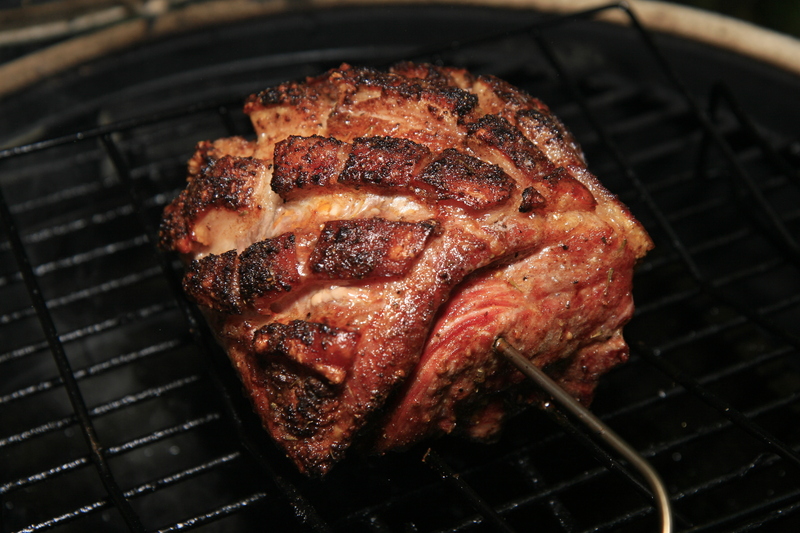 Set up a drip pan under a flat rack that you’ll place the roast on. 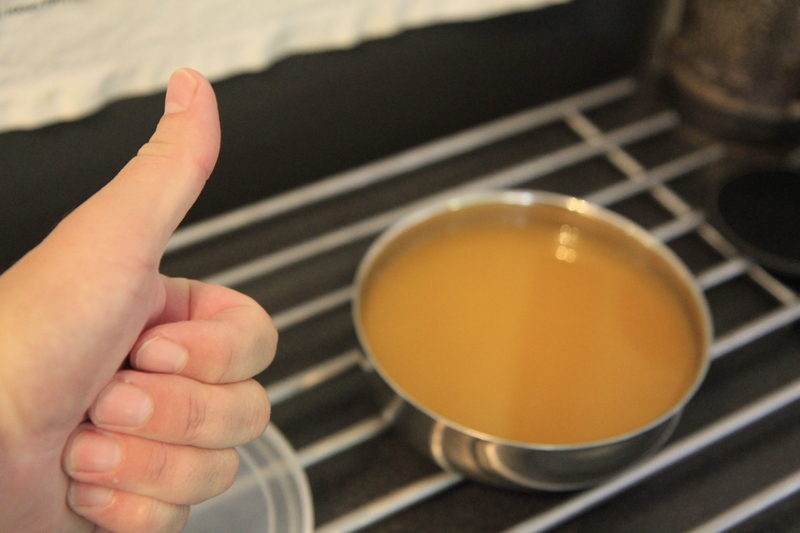 I added some hot beef stock to the drip pan, ensuring about 2 inches of liquid across the pan. Remove the roast from the fridge, unwrap and squish any of the remaining herb paste onto the roast. Now insert you thermometer probe from one end ensuring the tip ends up smack in the middle of the roast. You’ll aim for an internal temperature of 120F at which point you’ll take the roast off the grid to crisp it up. This method is aptly called “reverse searing.” It ensures even cooking, low and slow and then finishing it over super high heat which will create a crust across the entire roast. From start to finish the roast took just under 3 hours to get to absolute perfection. When your temp probe pings you at 120F, remove the roast and then set yourself up (carefully) for direct heat. Crank up the flames to as hot as the grill will go. On a BGE, this is done in a minute or two. Get a long set of tongs and keep the lid up. You want to ensure you’re cooking the surface not the middle of the roast. This process of crisping up the outside takes about 10 minutes. Roll the roast around ensuring you’ve got a uniform bark. I was running a small leg of lam roast next to the beef. They both reached the searing temperature at the same time. Something to be said for good planning and figuring out your maths! Remove the roast when it hits 133F (56C) – as the roast will cook just a bit longer, that will get you to an internal temperature of 135F which is also known as the Nirvana of medium rareness! I let the roast rest for about 5 minutes then snipped off butcher’s twine and thinly sliced the entire roast on a 45 degree angle. I plated the beef, carved up the lamb and no more than 15 minutes later, it was ALL gone! We had some pretty hungry guests clearly! Sadly, the birthday girl and I didn’t get any of the meat but I suppose when you’re throwing a big party, happy and properly fed guests are the priority. 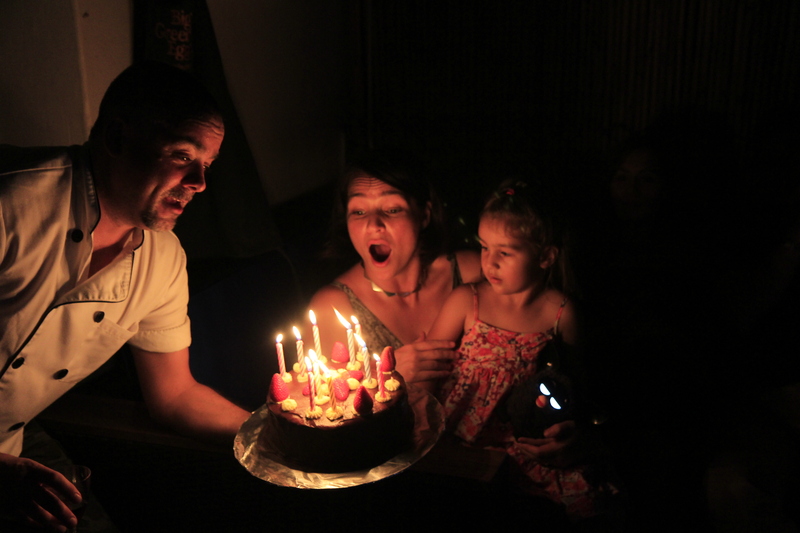 Let me tell you, we’ve thrown some epic parties in the past but this one, took the birthday cake! There were absolutely NO leftovers. Not the beef, or lamb, or pork ribs, or sausages…not the salads, breads, or desserts. We woke up in the morning (with splitting headaches) and thankfully I remembered the offcuts of the roast. I fried them up in some tallow along with two eggs and some super strong Vietnamese coffee. The last piece of the roast that went were the bones. Sparky, Nala and Bailey made out like bandits. (If you hadn’t guessed….these three are the dogs of friends!) I reckon those three were the happiest of all! All in all, a perfect evening with perfect friends and a perfect wife! Happy birthday again Heather! Look at the queue for the food… I’ve seen smaller ones at the Hawker Centre up the road! I rarely post video links but I came across this tonight completely by chance. 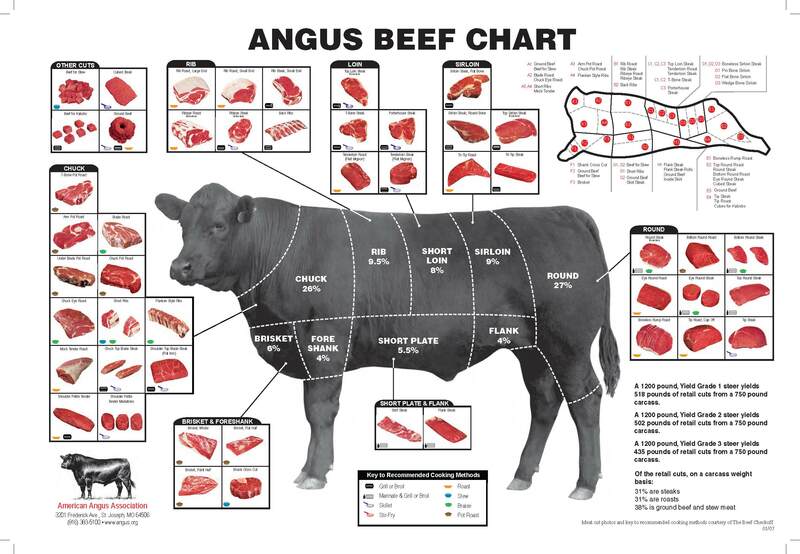 You’ve simply got to watch this and the next time you grill that perfect T-bone or Ribeye or Flank, remember to respect the animal, the farmer and the butcher. They all work hard to fill our tummies! Many years ago a band of brothers toiled and slaved in Investment Banking IT, arm in arm, day in and day out and years later, for all respectable reasons , drifted apart as many mates do. Well last night, the brothers, their wives and what seemed like way more kids than was even possible, descended on Roman and Heather’s back garden to participate in a pre-Christmas reunion of sorts. The celebration called for a very special menu: St. Louis cut KC ribs, slow cooked pulled pork and hickory ribeye, complemented by more sides than you could shake a stick at and Heather’s legendary chocolate pavlova! The ribs were purchased on Saturday morning, the day of the festivities. My buddy Kevin and I went down nice and early to West Coast Market to meet the legendary “Pig Lady”, a purveyor of fine swine from Indonesia. I purchased 6 mammoth racks of ribs and a beautiful pork loin (for the freezer) all in weighing an impressive 6.5 kg. The prep was pretty standard and easily done. 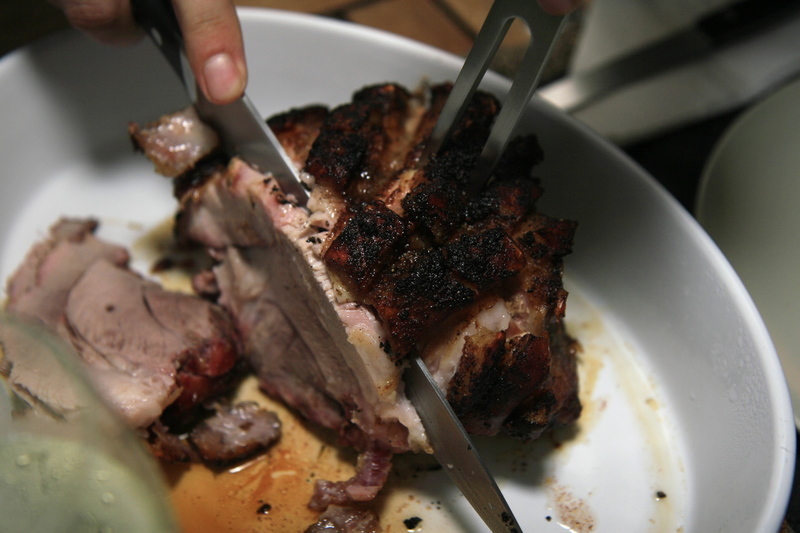 Rinse the ribs under cold water and make sure any and all bone fragments from “Pig Lady’s” knife-wielding are removed. Pat them dry and remove the silver membrane on the bone side. At this point I trimmed the ribs considerably. They’re massive and you can smoke and roast them but it’s tough to do as the thickness of each rack is different and hence the finish time would be as well. So, I trimmed off a lot of meat and saved all of it for slow cooked pulled pork instead. So, back to the ribs. Apply a coating of vegetable oil and prepare your favourite rib rub, liberally sprinkling both sides of the rib racks, especially between the bones. You want to make sure there’s rub in every bite of rib. Wrap them up in cling film and pop them back in the fridge for about an hour. Now, go set up your grill. You want to ensure you’ve got a full fire box of charcoal, mixed with about 2 solid handfuls of hickory chips. Set up the grill for indirect cooking and add a water pan that’s about 3/4 full. The resulting humidity mixes with the smoke that adds an almost bacon-like flavour to the ribs when you’re done. 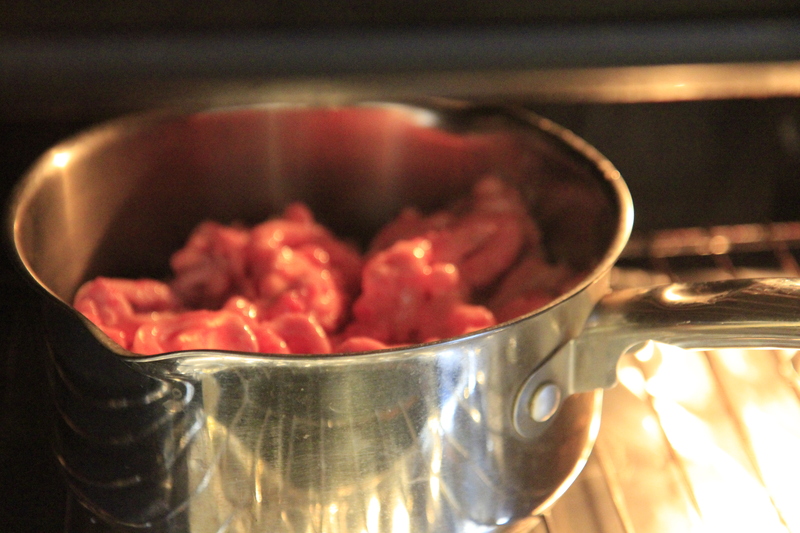 Aim to stabilise your internal temperature at 225F (107C) and make sure it stays there. You don’t want to go under 200F or over 250F if you can help it. With a bit of practise, you’ll be able to calibrate your grill to keep it chugging at a low and slow temperature. So how do you know they’re ready? Well, the ribs will have this incredible dark brown colour. You can take a pair of tongs and do the “bend test.” If the ribs crack under their own weight of the bended side, they’re done! Note that I hadn’t slathered them with any sauce until at the very last few minutes. Once you know they’re done, remove the ribs onto a platter and cover the ribs with one coat (both sides) of your favourite BBQ sauce. I used our family favourite, KC style sweet sauce. Let them sit for a minute or two while you remove your plate setter and get the grill going at a higher temperature, say 450F (232C). Keep the lid open as you place your racks back on to caramelise the sauce. Be careful here as you can easily burn your ribs turning all that time into wasted time. Once your sauce has bubbled up a bit and you see that the ribs have got just a bit of a char, it’s time to pull them off the grid.. I let them rest for a few minutes then cut them into individual pieces, serving immediately. So what did we do with the off cuts? Remember them? Well, cut them up into even chunks. Grab two onions and slice them thinly, crush 6 cloves of garlic, 1/2 cup of chicken stock, your rib rub and a bit of BBQ sauce. Lay the onions and garlic on the bottom of your slow cooker. Add the stock, and then the pork pieces that had been covered in vegetable oil and rib rub. Add a final squirt of sauce and put the lid on and crank it to high. 6 hours later, you’ve got delicious, juicy and tender pork pieces. Take each piece and simply pull them apart with two forks. It’s a bit of work but well worth the effort. Add the pulled pork onto a bun and squeeze a good helping of your favourite sauce and there you go, cheater’s pulled pork! A perfect steak for perfect company. Tonight we treated ourselves to a trio of monster sized T-bone steaks. In fact, this was Heather’s first T-bone and I assure you, she was not disappointed. The recipe calls for an interesting rub which turned out to be spectacular. I must admit, this was one of the better steaks we’ve had in a very long time. 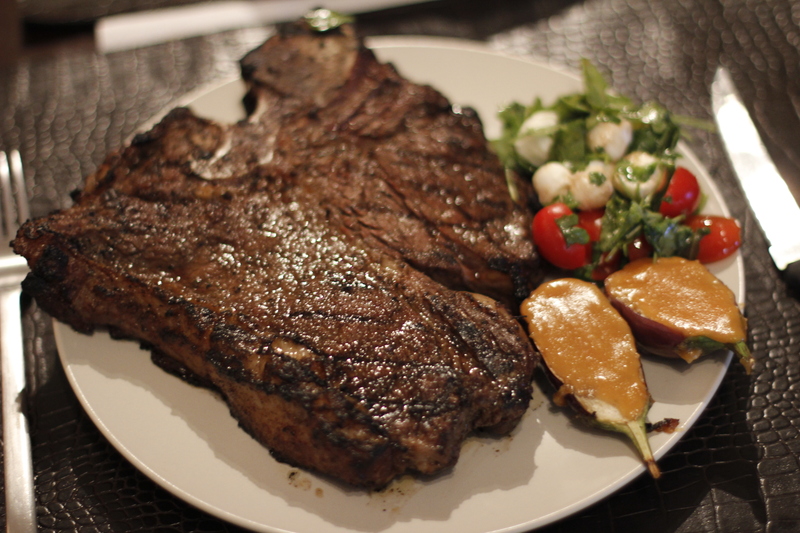 With the steaks, Heather served up a mozzarella/baby tomato salad and we also added mini-aubergine topped with a homemade miso-based bbq sauce. The result? A resounding 10/10….again! Lightly brush some oil on the steaks and season with the rub. Make sure you get an even coating on both sides. Put them back in the fridge for a few hours. I kept mine rubbed and ready for about 6 hours. Take them out just as you’re ready to start grilling. No need to bring them up to room temperature. I used a reverse searing method to get these bad boys done tonight. The magic temperature you want to aim for at grill level is 225F. Set up for indirect heat and just before you’re ready to put the steaks on, add in a chunk of mesquite wood. Once your grill has stabilised and you’ve got a pretty stream of bluish smoke, go ahead and place your steaks on the grill with an internal thermometer set for 115F. Once you get to that temperature, remove all the steaks and place them on a plate and get ready for the searing part. Now, get your indirect setup swapped out for direct heat and get your grill blazing hot! Baste the steaks gently with some olive oil so as not to remove any of the rub. Place your steaks back on the piping hot grid and keep flipping every minute or so until your internal thermometer reaches 135F (a perfect medium rare!) What you want to do is get an even browning effect that will produce a crunchy bark and a wonderfully tender middle. Reverse searing may seem counter intuitive but trust me, this is the best method once you’ve mastered it! Get your aubergines on the grill set at about 400F. Put them down on the cut side. Set your timer for about 3 minutes then flip them to roast the skin side. Once flipped, place a dollop of the miso bbq sauce on the cut side and grill for another 3 minutes. When ready, simply remove and serve! As you can see, the steaks were incredibly large. 2 steaks fed four of us and I cut up the last one for a snack tomorrow. I also took the bones and any large chunks of fat and made a beautiful beef stock. Simply add the offcuts, a sliced carrot, an onion, some garlic, 2 bay leaves, 2 stalks of celery and bring it to a boil. Then, turn down the heat and simmer for another 2 hours. Absolute gold…and NOTHING goes to waste! A great recipe, a great meal and something I’d happily recommend your try!